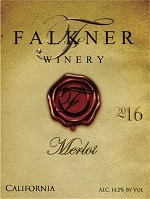 Another wonderful California Merlot with a ruby red color. Enjoy the added dimension of black cherry, blueberry, and slight plum flavors with a smooth finish that provides for a delicious wine. This wine pairs well with veal, pork, lamb, and beef dishes.